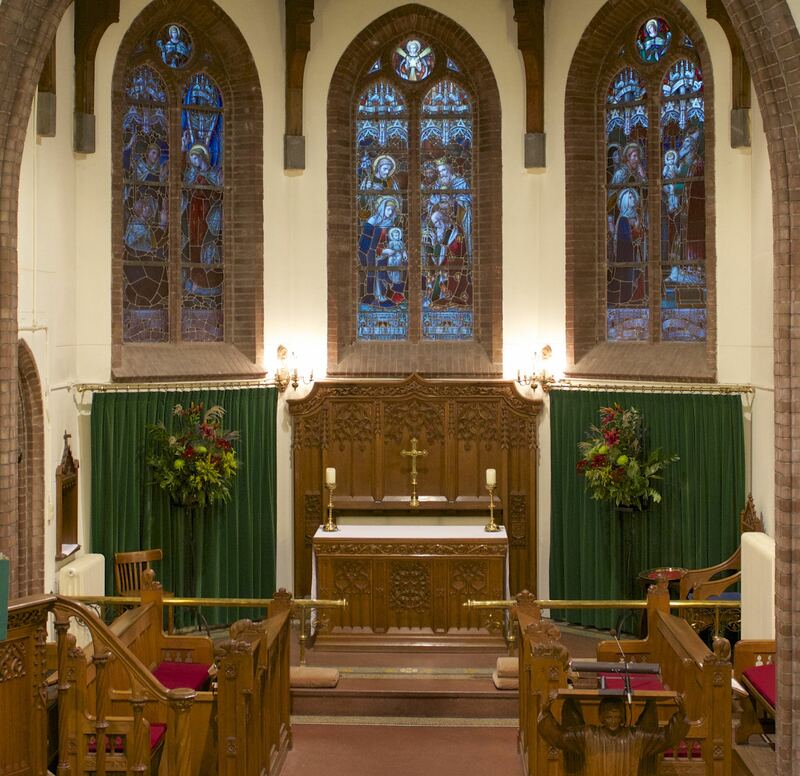 We are a diverse community with different church backgrounds, so we order our services in different ways, but all Sunday services are from the Book of Common Worship (weekday services of Morning and Evening Prayer and Holy Communion are from the Book of Common Prayer). For more on our understanding of Holy Communion, click here. For the months of July and August there is no All Age Worship nor Evensong. 10:30am All Age Worship Service with Holy Communion in English. A Gospel band leads contemporary music. The sermon is a short talk. After this monthly service you can join us after the service for coffee then for Godly Play and a bring-and-share lunch. 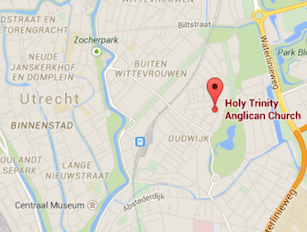 9am service Sung Communion in Dutch, traditional language service (sermon is usually in English). 10:30am Sung (2nd) or Choral Communion, in English, with organ and traditional hymns, Order One contemporary language Service. Our Choir leads on the 2nd, 3rd and 4th Sundays. 10:30am Choral Communion, in English, with organ and traditional hymns, Common Worship Order One contemporary language Service. Our Choir leads on the 2nd, 3rd and 4th Sundays. People have the opportunity to ask for a prayer team to pray for them privately after the 10:30am Sunday service. 10:30am Solemn Choral Eucharist, Common Worship Order One traditional language liturgy and incense is used. Both at 9am and 10:30am we offer a Creche and Sunday School for children. The teachers are bilingual. Your children are also very welcome to be in the service. NB. No creche and Sunday School during the summer months of July and August. 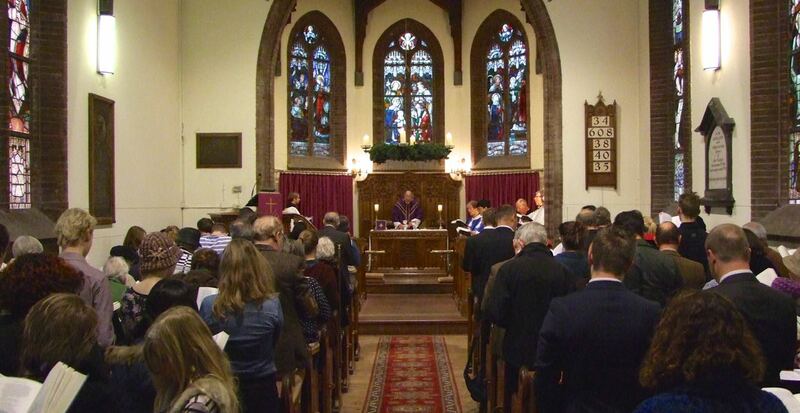 Four times a year we offer a Healing Ministry during the Sunday 10:30am Holy Communion service (though a private visit by the chaplain is always possible on request). After the sermon, a special litany is said, followed by a period of silence, during which there is an opportunity to bring before God what is troubling you and to ask for His healing. After the litany any member of the congregation who would like to receive the ministry of anointing with oil for the sick and/or the laying on of hands will be invited to come to the altar rail. It is normally on the third Sunday of each quarter of the calendar year (Jan, April, July, Oct) – but check our calendar for precise dates (as we change it when it conflicts with a major feast day). In addition to this Healing Service, on the third Sunday of every month, people have the opportunity to ask for a prayer team to pray for them privately after the 10:30am Sunday service. In our worship services we follow the Church’s Year. This means the readings, prayers and hymns fit the season or the day. The year is structured in such a way as to lead the worshipper through the life of Christ and the Church. At Holy Trinity we of course celebrate Christmas, Easter and Pentecost. But there are a number of other special services – for more please click here. On most Holy Days and major Saints’ days there is a Service of Holy Communion at 20:00, or, if it is on a Wednesday night, it is normally at 7pm. Check our Calendar for precise times and dates of services. O worship the Lord in the beauty of holiness, let the whole earth stand in awe of him.